We whipped out this gem of a Halloween craft the other day — and I just need to say – it might be the best quiet time activity I have come up with. Not to toot my own horn, but any activity that keeps my little ones engaged on and off for a week deserves to be shared here once again. Here’s hoping it gives your little Halloween ghouls a little bit of quiet fun too! As I was enjoying my time on Pinterest (and I absolutely LOVE my time on Pinterest) I stumbled upon this Giant Monster Window Art by Two-daloo. I thought it was absolutely adorable (you should read the post — her twins call him Frank and treat him like Santa – which just makes it that much more adorable). So, being inspired, I combined that great Two-daloo Pinterest find with Sammy’s current love of patterning and lining up paper …. 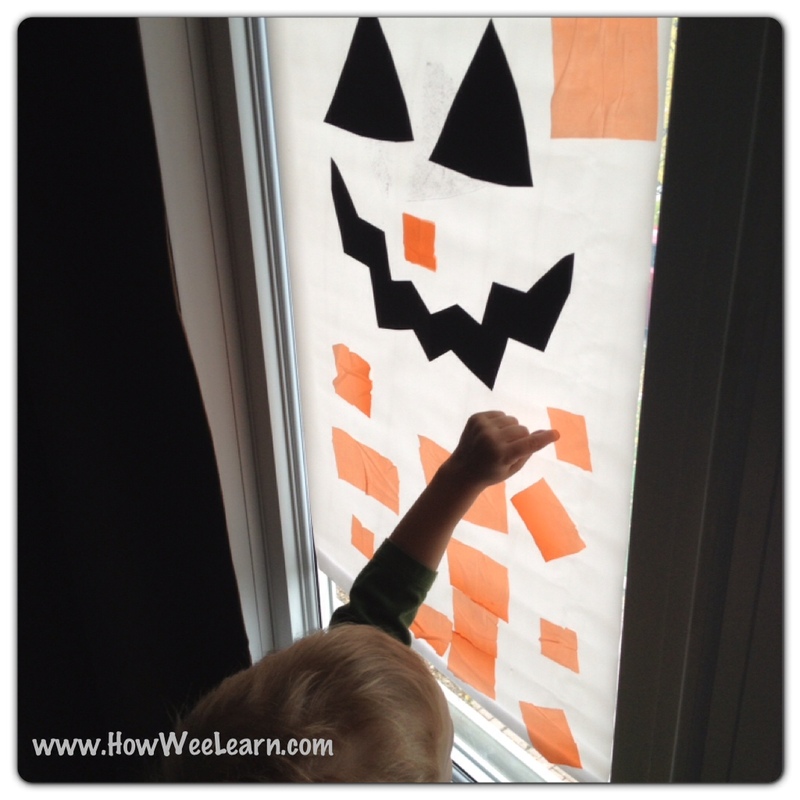 And we created a great big Window Jack-o-Lantern! It was so easy to make, but took Sammy a very long time to complete – which he loved! Sammy has been spending a lot of time carefully lining things up, sorting things, and ordering things, on the floor. Which is wonderful in so many ways! It is increasing his concentration, it’s a calming activity, great for fine motor control and math skills too. Anyways, I simply took a long piece of contact paper (it was actually a whole roll from the Dollar Store) and stuck it to the window. I put the sticky side out, and rolled the edges under – so the edges were sticky and stuck to the window. You could also tape it on with painters tape, but the rolled edges held up beautifully for us. Next, I cut up little squares of a Plastic Orange Halloween tablecloth. I had intended on cutting up Orange tissue paper, but the Dollar store was out. The tablecloth worked great! I had also intended on using clear contact paper – but I had run out, and the Dollar store had too. But there was no stopping me, I tell you! We simply improvised with white contact paper – I was getting that paper off the floor and away from wee brother hands!! We cut out 2 black construction paper eyes and a smile and popped it on the sticky paper. This was a happy Jack-o-Lantern of course, as all Preschool Halloween Decorations should be. 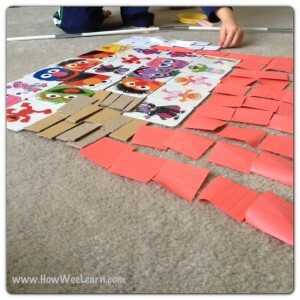 Then Sammy stuck the little squares of orange all over the sticky paper. I had assumed he would order the little squares and line them up, as he had been doing on his carpet, but he just stuck them all over randomly. It still looked great! We used a chair so he could reach up high (Madeline helped with the up high part too). It was a big task that he worked on (on and off) for a couple of days. After we would have snack or lunch he would announce he was heading “back to work” and would happily run down the hall to stick a few more orange squares on. 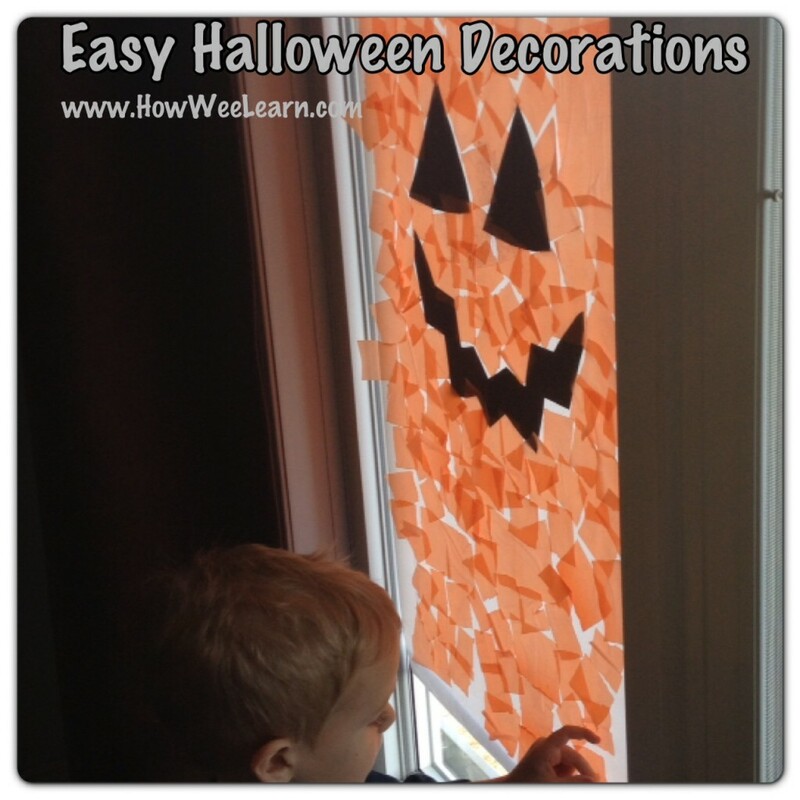 This was a simple, yet very engaging and easy way to make some Halloween Decorations! Sticky paper and tissue paper. How simple! 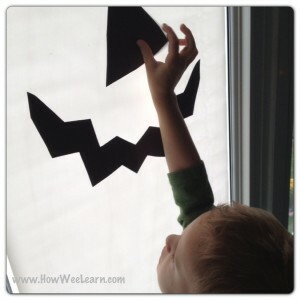 Halloween is still a day away – lots of excitement building and easy preschool Halloween Decorations making time left! 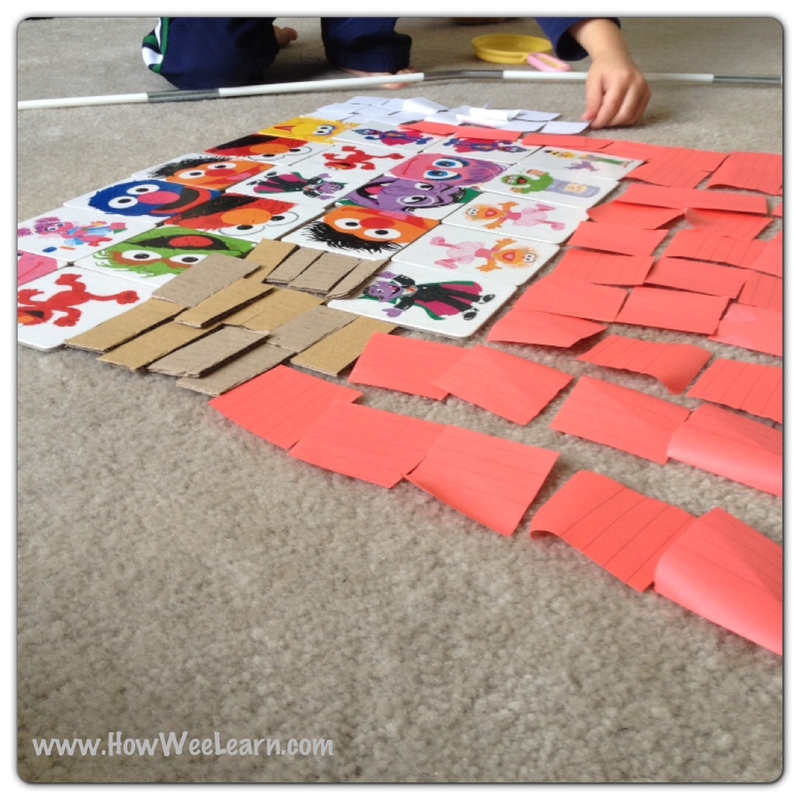 This one is a super last minute activity – mess-free and independent for wee ones. Please consider Liking us on Facebook and Following us on Pinterest so we can share more creative learning ideas with you and your wee ones! « A Neat Opportunity with VIPKID! This is such a fun window decoration – I’m sure the kids got a kick out of it! Thanks Carolyn – yes it was definitely a hit. In fact we did it again today at a friends house! Well done Sammy …. You sure are a busy Wee one. Happy Halloween to Madeline, Sammy and Ben!!!! Love reading all about your busy days there.